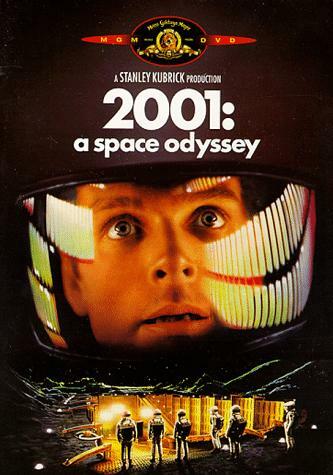 2001: A Space Odyssey — a classic of cinema, widely regarded as one of the greatest ever masterpieces of SF filmmaking. So in that case, why did it have people walking out of cinemas before the credits were even rolling? And why are people to this day wondering what the hell it was all about? Mystified rather than enthralled by the bone-throwing monkeys, the waltzing spaceships, the madness of HAL (the only part where anything actually happens, some would say), then that hypnotic lightshow leading to the bizarre finale in the hotel room? Are those people just stupid? Only fit for the kind of popcorn-munching movies that need no thought or intelligence to appreciate? Or could it be that those who rave about the film have actually fallen prey to the biggest bout of “Emperor’s new clothes syndrome” ever to hit SF cinema? Because when people wax lyrical about the epic stature of the film and the deep philosophical meaningfulness of it all, what tends to be neglected is any consideration of what sequence of events is being portrayed — or to put it another way, the apparently trivial matter of the plot. And that is probably because it doesn’t appear to have one. Now there’s no rule saying that a quality intellectual film has to have a neat, tidy story, with a beginning, middle and end — to say so would be blinkered in the extreme. But 2001 is different. It’s different because it already has a story — in the form of Arthur C. Clarke’s novel — and what’s more, it’s one of the greatest, most profound stories that has ever been told. It’s just that to anyone watching the film without the aid of prior knowledge, the story is completely invisible — and that, frankly, is a failing. Sure, the film isn’t a direct adaptation of the book — the reality of how the two came into being is more complex than that. But fundamentally it’s the same — human evolution is deliberately set in motion by extra-terrestrial intervention; a machine is then planted on the moon to act as a tripwire, to signal when the resulting intelligence takes its first steps into space; and then the next stage in the experiment — to take a member of that race and turn him into something approaching the god-like status of the extra-terrestrials themselves. Clear? On the page, maybe, but you’re doing well if you can extract that information just by watching the film. It’s like the way the apes are on the verge of starvation before their brains are altered, the way their newfound affinity for tools makes them better at killing each other as well as hunting, and the way that both of those abilities go on to influence their subsequent development — obvious (as if) from the fact that the spacecraft which replaces the flying thighbone is actually an orbiting battle station. Even some who claim to like the film see the apes and the bone-throwing as nothing more than a metaphor for man’s natural evolution. It’s an old cliché that the film is never as good as the book. In this case, you haven’t a hope of understanding the film unless you’ve read the book. The hairs on the back of my neck still stand up when I read that passage, and imagine what he must have been seeing as space turned in on itself. How does the film handle this scene? No dialogue or explanation, just multicoloured shapes flying out of the screen, and a picture of Bowman’s eye, shifting from one false colour distortion to another. That says it all really. Of course effects were limited in those days, and budgets were too, but if “master filmmaker” Kubrick really wanted to make people understand what they were seeing, he could have done. What he actually did — here and throughout the film — can only be described as pretentious at best, and arrogant at worst. (PS if it sounds like I’m laying the blame squarely at Kubrick’s feet then to an extent that’s true, but I’m a commited Arthur C. Clarke fan, and this isn’t the only supposedly classic Kubrick film that I’ve come away from feeling less than overwhelmed — I may write up some of the others if time permits). So do I hate 2001? To be honest, no — I see it more as a wasted opportunity. At least with other disappointing book-to-film adaptations, all you have to do is wait until someone else comes along and does it properly (for instance I’m still waiting for a proper big-budget 1890s War of the Worlds adaptation to be made). With 2001, that will never happen, because the visuals and cinematography have entered our culture to the point where they are fixed, immutable. No one will ever again film the Discovery against the backdrop of Jupiter, or voice the smooth, sinister tones of HAL, or show his eerie red eye watching and plotting. The film is iconic and unique, and everything people say about its status as an epic of cinema is correct. It is spectacular to watch, it is a breathtaking piece of visual artistry. In fact I have a copy of it myself and watch it once in a while, and what’s more I even enjoy the spectacle of it — but only because I’ve done my homework and know what I’m looking at. That shouldn’t have to be the case. The idea that a profound, meaningful film somehow has to be so impenetrable that you can’t even tell what’s happening is simply wrong. College film students make that mistake – Kubrick of all people should have known better.